I've been researching pleats and folds as part of looking for information on shibori. I am also thinking of buying a smocking pleater to use for pleating fabric before dyeing it. I'm just looking around for one I can afford, preferably with instructions on how to use it. 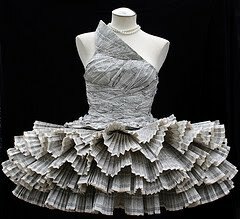 In the meantime I found some fascinating stuff on Youtube about origami and a wonderful pleated dress made by Jolis Paons out of telephone books. Click on the word 'telephone books' to go to Jolis' Flickr site. I think it is one of the most amazing pieces of Wearable art I have seen. and pleated origami bowls and structures by Paul Jackson. Sri threads have some really lovely antique shibori fabrics on their blog at the moment. I went to Arimatsu Shibori Museum last year and took this photo because I couldn't afford to buy any of the fabric so had to make do with a photo. 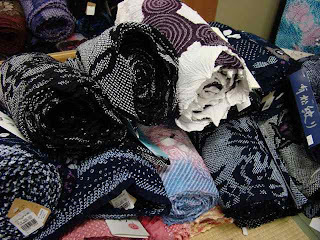 I think I prefer the stuff on the Sri threads blog to the more complicated patterns on the pieces below (from the shop at Arimatsu Shibori Museum, near Nagoya).